The town of Westport on Ireland's west coast is a delightful community situated on an Atlantic Ocean inlet called Clew Bay in County Mayo. The Carrowbeg River flows through the town, and there are several picturesque stone bridges that cross over the river. 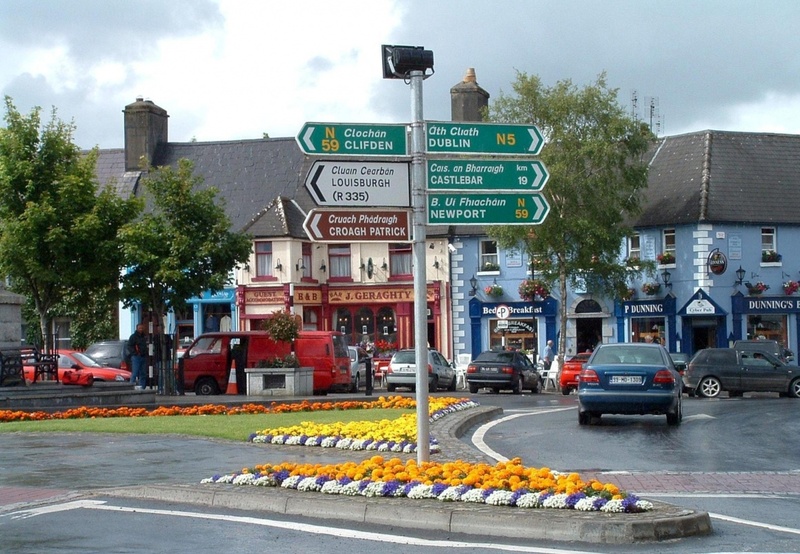 In a competition held by the Irish Times newspaper, Westport won the 2012 title of 'The Best Place to Live in Ireland.' The town was chosen from over 500 other Irish communities because it is a beautiful and impeccably maintained example of the best that Ireland has to offer. There are many reasons why Westport is one of the most prominent tourist attractions in all of Ireland. Westport has both spectacular landscape and a rich cultural heritage. A mountain peak called Croagh Patrick is extremely popular with visitors to the town. There is a rocky footpath that leads to the summit at 2,507 feet above sea level, and the temptation to climb to the top is too much to resist for just about anyone who comes to Westport. As you ascend to the top, the views of Clew Bay and the surrounding countryside are simply awesome. Another part of the natural beauty around Westport are the many wonderful beaches that tourists find so inviting. For example, the Bertra Blue Flag Beach, located just seven miles west of Westport, is a perfect place to spend the day with the family. During the summer, there are lifeguards posted so you can safely swim in the pristine water. Walking along the shore and surf fishing are also great ways to get back to nature. The celebration of music and the arts has been a long-standing Westport tradition. In August, the town hosts the Westport Music Festival with a variety of live music performed from a stage positioned in the Carrowbeg River. In October, there is the Westport Arts Festival which involves over 100 performances spaced out over two days. You can see acrobatic theater and music, street theater, entertainment for children and many other artistic shows. You can also visit the fine art galleries in Westport all year round. The Andrew Stone Gallery on Bridge Street and the Customs House Studios at The Quay feature outstanding collections of contemporary art. When you get hungry during your stay in Westport, you will find that the town center and the Quay area are home to an extensive array of great restaurants. Find information about selected Hotels, apartments and rooms at Westport to choose the perfect place for your accommodation.